On the fumes of a dream, twin brothers Gary and Larry Lane have written a script with a plum roll for one of their idols, Dolly Parton. Having had no luck getting the screenplay into her hands, they embark on a cross-country journey to personally deliver it to her. They set off from Dolly’s star on the Hollywood Walk of Fame heading East for Pigeon Forge, TN. Driving an RV they (named Jolene) is friend and partner Mike Bowen. All along Interstate 40 at rest stops, RV parks, bars, and hair salons our intrepid band of travelers meet everyday Americans, as the encounter everything from Floods in Nashville to an Oklahoma Tornado. 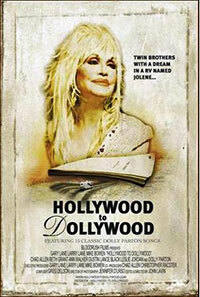 The journey is also one of discovery for the brothers, as well: their relationship with their parents; their hopes, fears and ambitions; the bigotry they’ve encountered; as they search for tolerance and acceptance and the joy of realizing their biggest dream handing their screenplay to Dolly Parton. Featuring appearances by Leslie Jordan, Chad Allen, Beth Grant, Dustin Lance Black, Ann walker, and maybe even Dolly herself! Hollywood to Dollywood is a documentary of chasing dreams down the road of life.